Looking for Pampers New Baby? Pampers Premium Protection has improved product features and comes in updated packaging. Wrap your baby in Pampers Premium Protection, Pampers' softest comfort and unbeatable skin protection, approved by the British Skin Foundation. 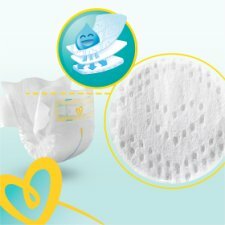 This nappy provides feather-like softness, and is now lined with Heart Quilts to feel even softer against baby’s skin while pulling away wetness and mess. It also has a Wetness Indicator to tell you when your baby might need a change. Finally, Pampers make sure your baby’s delicate belly is protected with its Navel Friendly Cut. Use with Pampers wipes. Packaging may vary. To avoid danger of suffocation and/or strangulation, keep all packaging material away from babies and children.